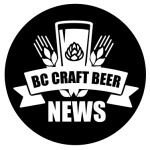 BC Craft Beer News Publishes 1st Edition!! their first addition which is currently being distributed to as many craft beer friendly locales as possible around the province. The publication, launched by craft beer lovers Kenn Dubeau and Julia Chalifoux, is, according to the introduction in the newspaper, "dedicated to the promotion, growth and enjoyment of craft beer and brewing culture in BC," and features contributions from many well-known personalities from the BC craft beer community including the Thirsty Writer, Joe Wiebe, who is currently touring the province promoting his new book, Craft Beer Revolution: The Insider's Guide to BC Breweries , and well-known beer blogger/rantmaster extraordinaire Chuck Hallett, better known as Barley Mowat. See below for a complete list of contributors for the first edition. "I think the timing for BC Craft Beer News is right," wrote Chalifoux in an email to VEBB. "There is a lot going on in the world of BC craft beer (and spirits and cider) at the moment. Having a dedicated source by which people can be informed, educated, entertained, heard and have the opportunity to connect is very important." The BCCBN has printed 15,000 copies for their first edition, which, as the name alludes to, focuses on BC craft beer, but not exclusively so. Page 12 is dedicated to craft cider, with an informative article by Cinder Monger. Future editions will also include articles about the BC artisan distillery industry as well, as the newspaper understands that those who are interested in craft beer recognize quality products and most likely support the other local craft alcohol industries. But make no mistake, this is a BC-based publication focusing on our vibrant and growing craft beer industry. As Joe Wiebe states in his book's introduction, "welcome to the revolution". The smile on Mayor Gregor Robertson's face and sigh of relief from Brassneck Brewery's Nigel Springthorpe Tuesday night said it all. Vancouver City Council had just embraced the idea of on-site lounges in breweries with open arms. As most of you reading this know, Vancouver City Council voted unanimously to amend zoning and development by-law to accommodate lounges as an accessory use to breweries and distilleries. In layman's terms, they voted to change zoning by-laws to allow us to drink beer in lounges located on-site at breweries. This massive step forward for the craft beer culture in Vancouver came at us travelling at lightening speed with the motion put forward April 23rd, a mere 11 weeks ago, by NPA Councillor George Affleck to have, "(City) staff report back to Council on the required changes to the relevant regulations within the City of Vancouver that would permit micro-breweries, wineries and distilleries on industrial land to sample products produced on-site, thus being consistent with provincial liquor policy," which was debated and passed that night. Since that time city staff looked at what needed to be done, came up with recommendations, presented them to council who approved the recommendations and Tuesday the whole process came to and end with the public hearing. Much of the reason for this is that the City and brewery representatives have basically been on the same page since the motion was tabled. This fact was highlighted several times during the public hearing with Brassneck co-owner Conrad Gmoser thanking the mayor and his council for being so accomadating and with the Mayor Robertson and several councilors thanking the brewers for being so darn nice and easy to work with. Both sides met twice in consultation meetings which by all accounts, went very smoothly and without much, if any, conflict. Even though I did not attend the meetings, I may have been the only source of aggravation, as I was told by a few who attended the first meeting that staff from the mayor's office asked the brewery contingent if any of them knew who Paddy Treavor was, probably as a result of my open letter to Mayor Robertson and City Council, which was described by Clr Affleck as "nasty", and my subsequent meeting with George Affleck who responded to my letter by contacting me. It has been a pleasure to see all the Vancouver craft breweries band together and forget about competition for a few moments to work on getting this passed whether they were planning on having a lounge or not. It was great to see Vancouver City Council play nice with each other and work quickly to get this done. And it was great to see the local craft beer supporters come out of the woodwork to support this motion when possible opposition came into the picture this past weekend and myself, Barley Mowat and CAMRA Vancouver started rallying the troops. That cry for support resulted in 773 form letters, sent by supporters via Barley Mowat's blog, and 58 individual letters, sent in over a 48 hours, clogging up the city clerks in-box. And as a result of everyone playing nice and getting along, almost everyone has basically gotten what they want in what I have described over and over as a win-win-win situation. Clr Affleck, the only NPA councilor on City Council, received overwhelming support from the Vision Vancouver-heavy council and had his motion passed, which he joked, "hasn't happened very often". Mayor Robertson, who was joking and laughing at the end of the meeting and his Vision council will be remembered as the gang that brought beer lounges to Vancouver. The brewery owners and brewers, well, they are still pinching themselves to make sure this isn't still all a dream. Consumers are giddy and just itching for these lounges to open. The only group that really didn't get what they wanted were the "possible threat" I mentioned, Campaign for Culture, who although they support the idea of lounges in breweries wholeheartedly, did not support this motion as they felt it was too restrictive. As a result of their opposition to some of the restrictions, they started an email campaign of their own which resulted in 70 form letters being registered in the "opposed" column. But even they walked away from Tuesday's public hearing smiling as two of the three restrictions they want lifted, hours of operation and the amount of special events that can be held, are to be reviewed in a year's time and if things look good, could be made less restrictive. The only restriction CFC wanted lifted that council refused to look at was size of the lounges which will stay fixed at 80 sq metres. Even I came out a winner, as Mayor Robertson thanked me for bringing this issue to City Council and did not throw one single brick or sick one single security guard on me during the evening. For those of you who have lots of time on your hands, I have added the links of the City's presentation to City Council, which outlines everything you need to know about this subject and the changes being made in a PowerPoint presentation. I have also linked the video broadcast of the whole public hearing where you can see exactly was said by all parties. Last night the City of Vancouver took a huge step forward in modernizing their liquor policies by unanimously approving zoning changes to allow breweries, distilleries and wineries to have small, licensed lounges on-site where they can sell their products to be consumed. The by-law changes removes the roadblocks (read here) in Vancouver that were preventing breweries from taking advantage of a recent provincial liquor policy changes allowing breweries and distilleries to apply for endorsements to their manufacturing licenses to run on-site, licensed lounges giving them equal footing with wineries who have had this opportunity for years. As of today, breweries can apply to the Liquor Control and Licensing Branch for their lounge and special event endorsements (see link above)| with the knowledge that they have clear sailing as far as Vancouver City Council is concerned. That is the good news which has the local craft beer industry and craft beers consumers hoisting a jar of their favourite local brew in celebration. The bad news is that according to a LCLB spokesperson, "(t)he application process for a designated lounge is similar to the application process for a bar or pub, in that it requires a resolution from local government and the gathering of views from the public. A general estimate is 7 – 12 months from the time we receive a complete application." Before we get all up in arms about the proposed 7-12 month wait, it was clear last night that Mayor Gregor Robertson and Vancouver City Council are totally on board with these lounges and want to see them open ASAP, so there should not be any resistance in the process at the municipal level. But the application (see here) is a seven-page monster which outlines several steps that must be completed with reviews, inspections, more reviews, more inspections...you get the idea. But for now, we rejoice! It has been just over two months since NPA Councillor George Affleck met with yours truly (read here) and decided to put a motion together requesting City staff to look into what changes need to be made to allow brewery lounges to exist. In political time, two months is a blink of the eye to get such changes made and Mayor Gregor acknowledged this by thanking Clr Affleck for tabling the motion, Vancouver City city staff for their quick work in putting together the recommendations, the local craft brewers for working so amicably with the City to come to an agreement in regards to restrictions and Vancouver City Council for moving so quickly and to get things done. Heck, he even thank me for bringing the issue to the attention of Clr Affleck and City Council. Maybe I didn't have to move to Powell River after all?? Stay tuned for a full report about the Public hearing, reactions, restrictions etc...I have to hit the road right now to embark on a two-ferry journey with my wife and three-year-old to head home... I think I am going to need one of these beer lounges by the end of the day! As a final word, thanks to all who made this happen: George Affleck, Mayor Robertson, Vancouver City Council, local Vancouver brewery folks who work together as a group and with City Hall, Barley Mowat who helped rally the troops, CAMRA Vancouver for getting word out support was needed and to all the craft beer lovers who took the time to write City Council and/or come out to the public hearing. Ever since NPA Councillor George Affleck set in motion the chain of events that has Vancouver on the verge of allowing on-site lounges in breweries, distilleries and wineries, there has been overwhelming support for the idea. Tuesday night the final step in the process takes place with a Public Hearing, held at 6 PM in the City Council Chamber, where submitted letters and emails will be reviewed and those who feel the need to voice their thoughts directly to City Council will have their opportunity to speak. Despite the support, their are a few who do not like the proposed changes to Vancouver's by-laws and the restrictions being placed on the lounges outlined in a report received by Vancouver City Council from the Vancouver City General Manager of Planning and Development Services. Campaign for Culture (CFC), who describe themselves as, "an association dedicated to the enhancement of the social and cultural fabric of British Columbia," believe the proposed changes don't go far enough and have started an email campaign in an attempt to get Mayor Gregor and his crew to lift some of the restrictions recommended for on-site lounges, specifically the size limit of 860 square feet, the 11 PM closing time and the limit of having only ability to host only 2 special events per month. CFC organizers believe that lounges should have the ability to be much larger, open later and host more events if they so desire, more in line with Provincial regulations. At the time I am writing this post (Sunday, July 7) there are 13 items of correspondence related to this issue that have been sent for the Public Hearing and 12 of those are in the "oppose" column, all identically worded letters that have been generated by the CFC email campaign (read here). Despite the fact the CFC are not against the lounges existing, but instead are opposed to the restrictions being imposed on the lounge and special event areas, the letters are being considered by Vancouver City Council as opposition. Having spoken to the CFC folks, I have been told many more letters supporting their campaign are going to be sent to Vancouver City Council. The problem with CFC trying to bring about these changes in this way is that by showing strong opposition to the recommended changes, especially when only one letter of support (read here) has been received, the whole process could grind to a halt and be rejected, meaning the status quo would remain and no on-site consumption lounges within Vancouver City limits even though Vancouver City Council passed Affleck's original motion and accepted the recommendations made by the General Manager of Planning and Development Services. And although they have not made any official opposition known via the Public Hearing website, the Alliance of Beverage Licensees of British Columbia are not too keen on these lounges existing and could still mobilize their opposition. If ABLE gets rolling, it could be the death of the proposed changes as they are very well connected politically and have a lot of sway in the province when it comes issues related to alcohol. Personally, I am okay with the regulations being proposed. I see these lounges as being small, intimate places, family friendly, where you go for to taste a few of your favourite brews right at the point of production, not places to go out with large groups of friends to get swacked on a Friday night until the wee hours. I know the local craft beer industry is okay with moving forward as is in regards to the recommendations as they were part of the consultation process and were well aware of what was happening. For the first time in a long while those from the Vancouver craft brewing industry organized and worked together to help get Vancouver City Council to this point by making the Vancouver craft beer industry wants and needs known in regards to on-site consumption lounges. All brewery owners in Vancouver I have talked to do not want to have a lounge open until 2 or 4 AM at their brewery and would not staff one and stay open until those late hours even if they were allowed. I am very disappointed that there has only been one letter of support and that did not come from any of the brewery owners who would benefit from these changes. I am also embarrassed to say that until I found out that there was no official support being shown for the changes save the one letter, I had not written in despite the fact it was my yelling and screaming about the issue that got the attention of George Affleck which resulted in a meeting between us and the motion that set all of this in motion. I have rectified this and written my letter and if you love craft beer in Vancouver and want to support your local breweries and have the opportunity to enjoy some of their great beers in lounges at the breweries, I recommend you do as well. It takes 30 seconds to write an email of support that could result in permanent and positive changes to our local liquor policies. This type of thing is specifically what groups like the Campaign for Real Ale (CAMRA) are designed for and members should get active and support the cause. Getting these recommendations through the Public Hearing and changes made is a win-win-win situation for Vancouver, the local craft beer industry and craft beer consumers. Email mayorandcouncil@vancouver.ca and let's get this thing done! Remember the hearing is Tuesday at 6 PM so emails should be sent before 4 PM on Tuesday.